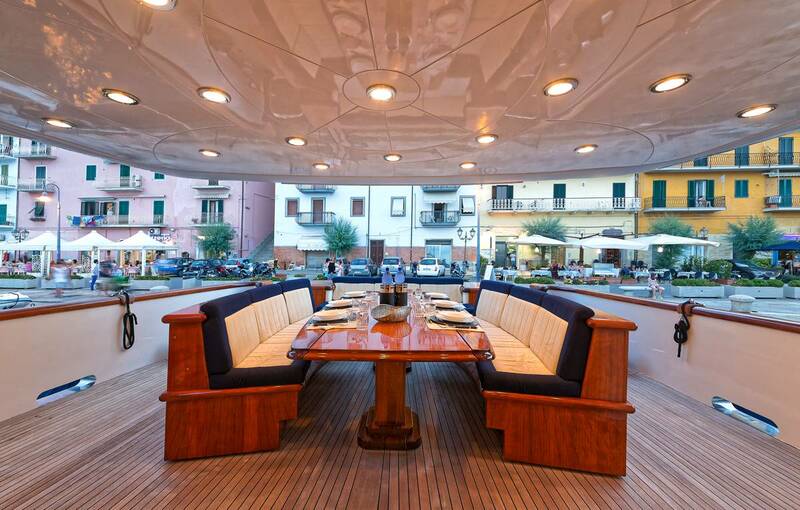 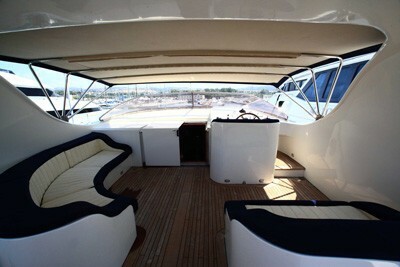 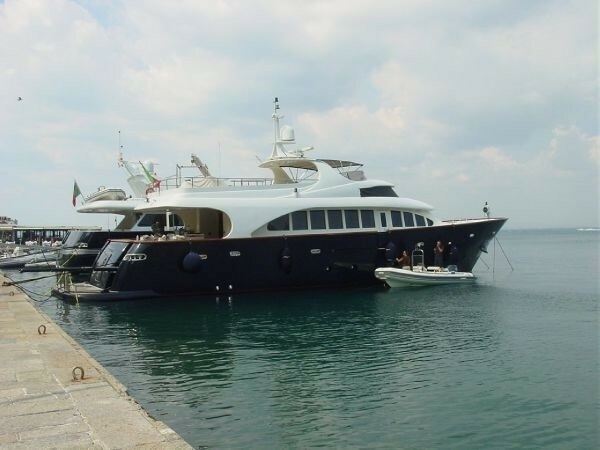 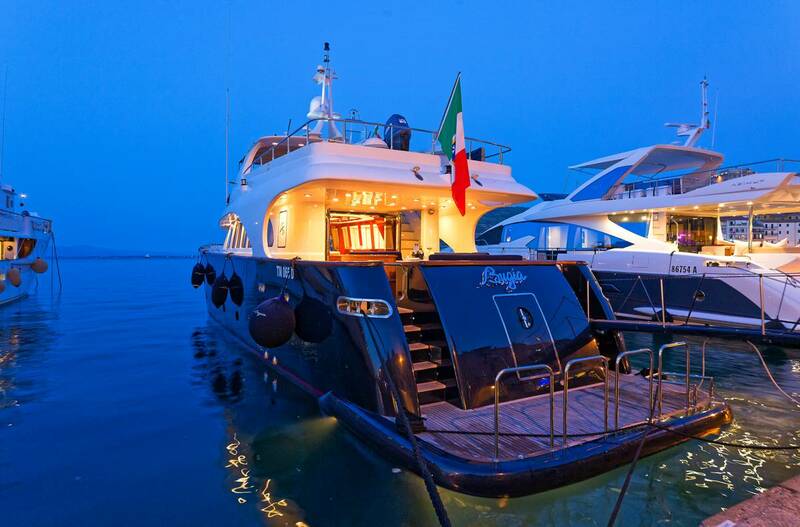 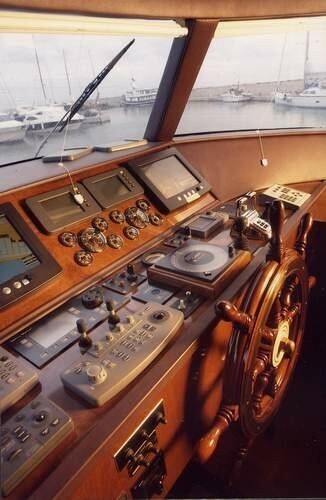 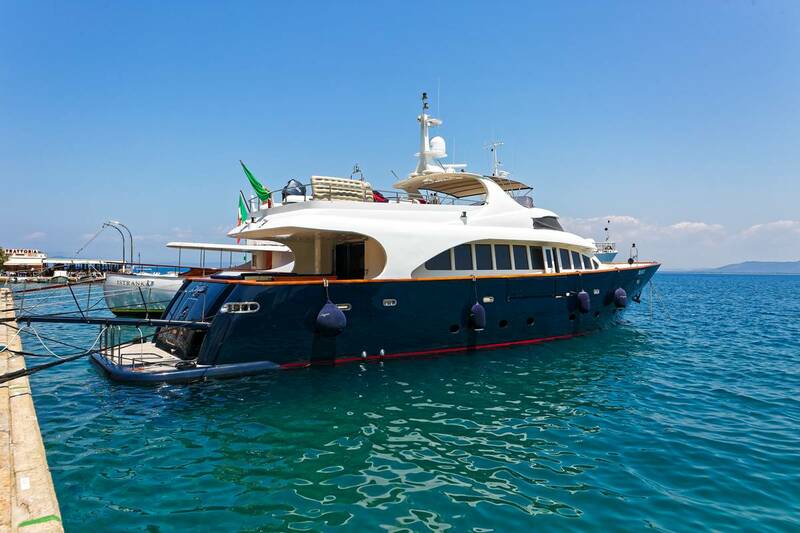 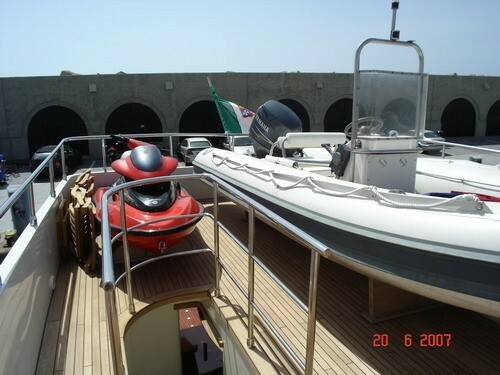 Luxury yacht BUGIA was launched by Cantieri Navali di Termoli yachts of Italy and designed by Ing. 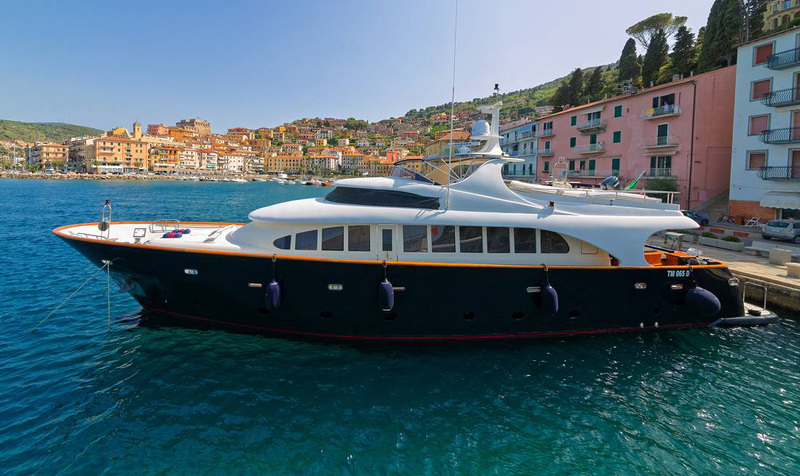 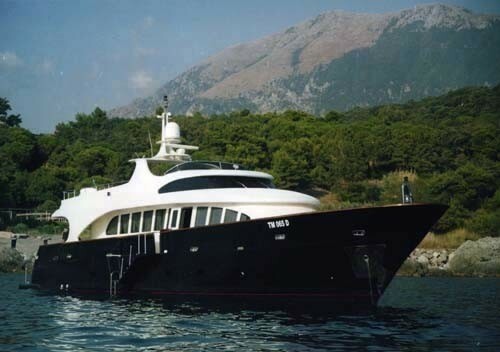 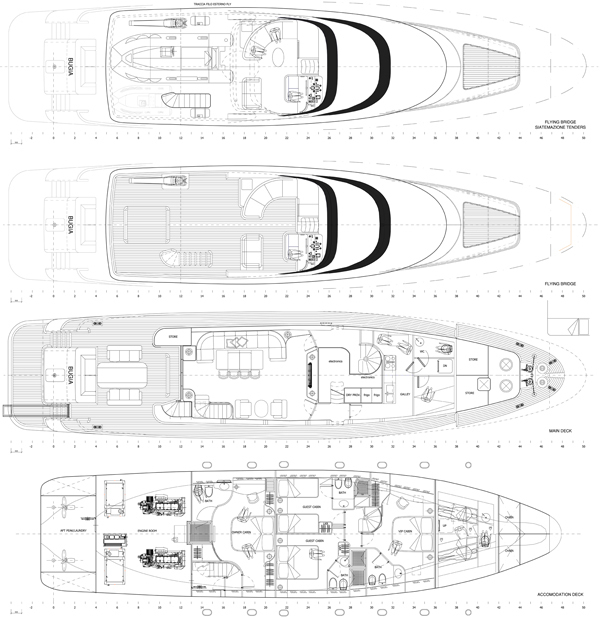 Russo in 2006, she is a steel displacement hull measuring 27 meters (88.6ft) and can accommodate up to 9 guests in 4 cabins while chartering in the beautiful Western Mediterranean. 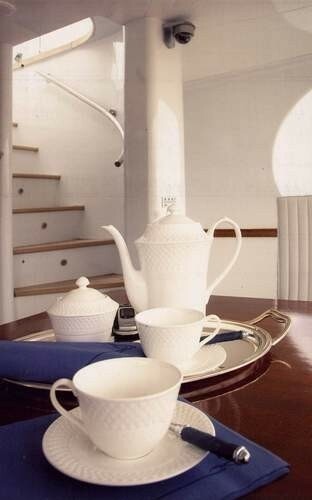 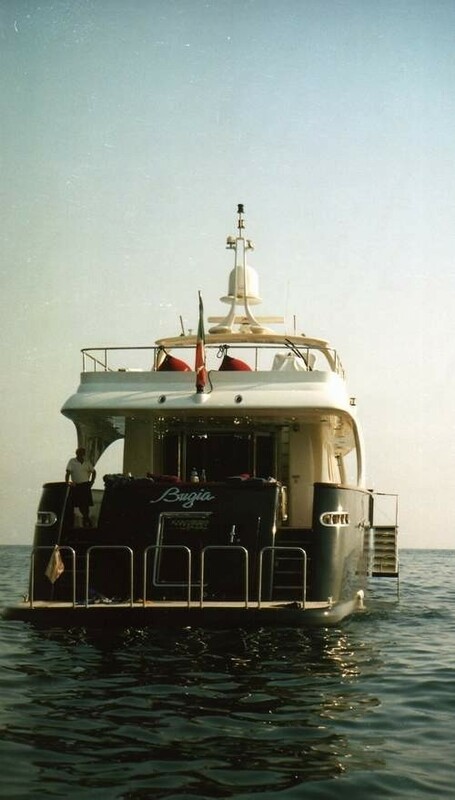 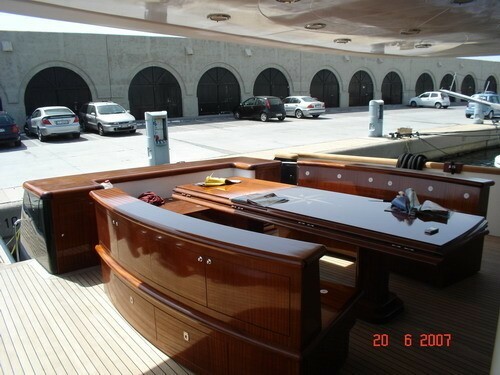 Motor Yacht BUGIA has an Italian inspired interior with elegant soft furnishings and warm cherry woods; the salon is adjacent to the aft deck through folding glass doors and features and L shaped sofa with additional chairs and a large coffee table on the port side, a flat screen TV is housed on the starboard side in a lifting compartment. 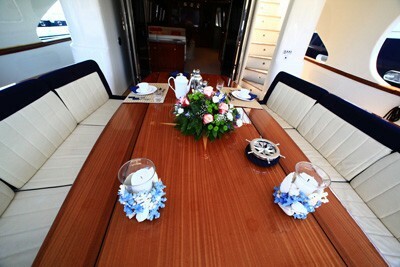 The formal dining space is cleverly disguised within the salon as the mahogany coffee table raises and expands to comfortably seat dinner guests. 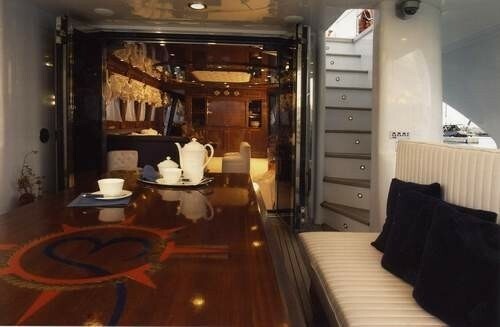 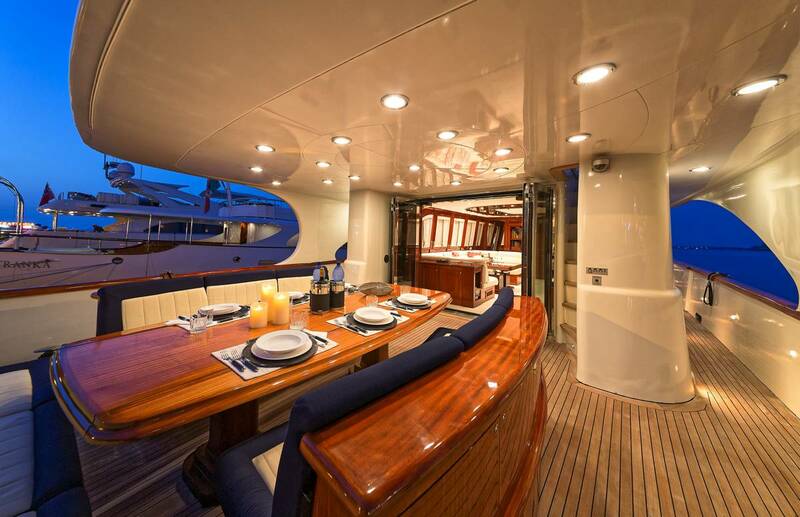 Step out from the salon through the aft glass doors onto a large aft deck which is shaded and offers an alfresco dining option at a custom built high gloss oval wood table. 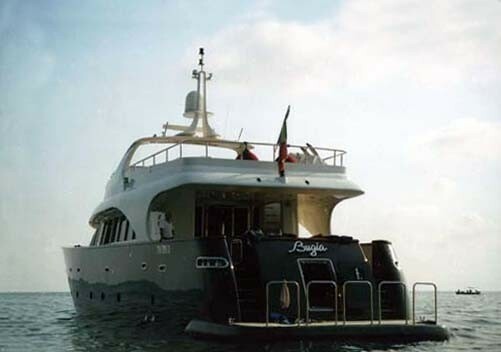 M/Y BUGIA is the ideal yacht for water activities with an extended swim platform. 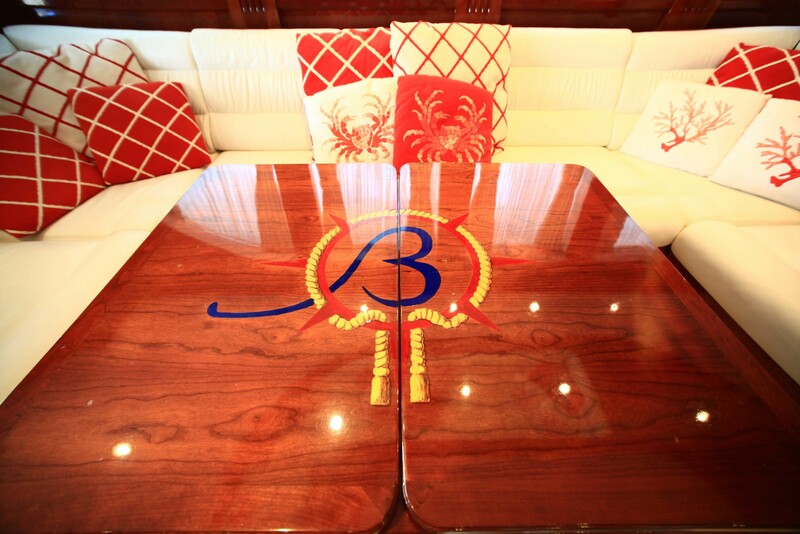 A generous sundeck is located above the main deck and is equipped with sun mattresses, deck chairs and tables. 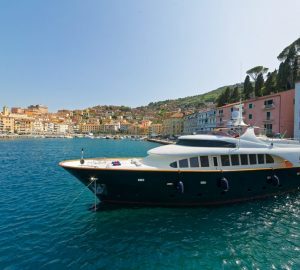 Charter Yacht BUGIA has a beam of Beam 6.5 Meters (21.3Ft) and a draft 2.5 Meters (8.2Ft), the yacht cruises at 11 – 13 knots. 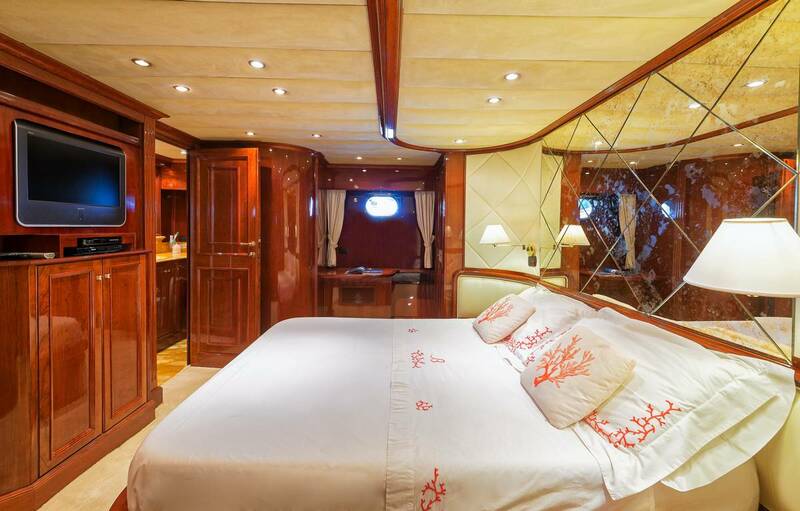 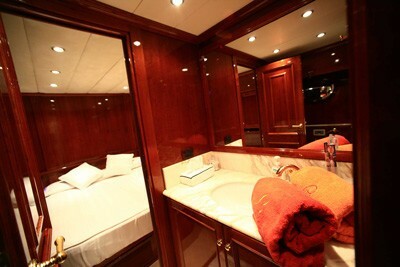 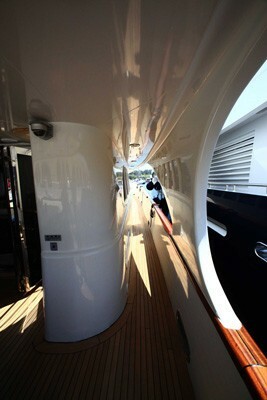 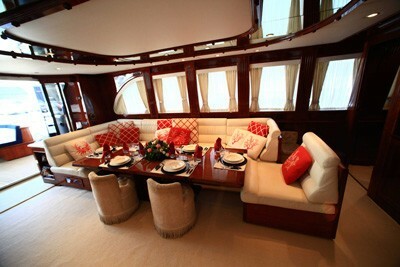 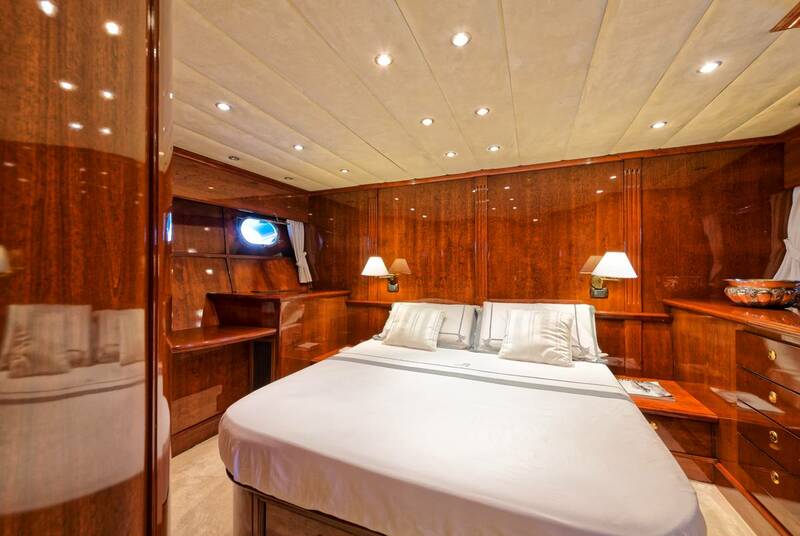 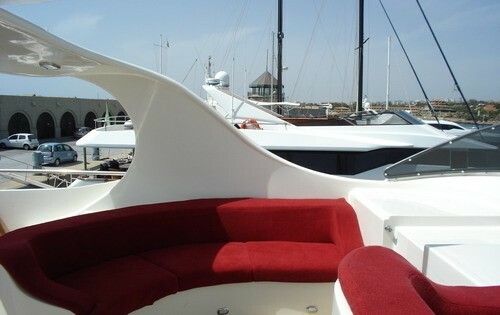 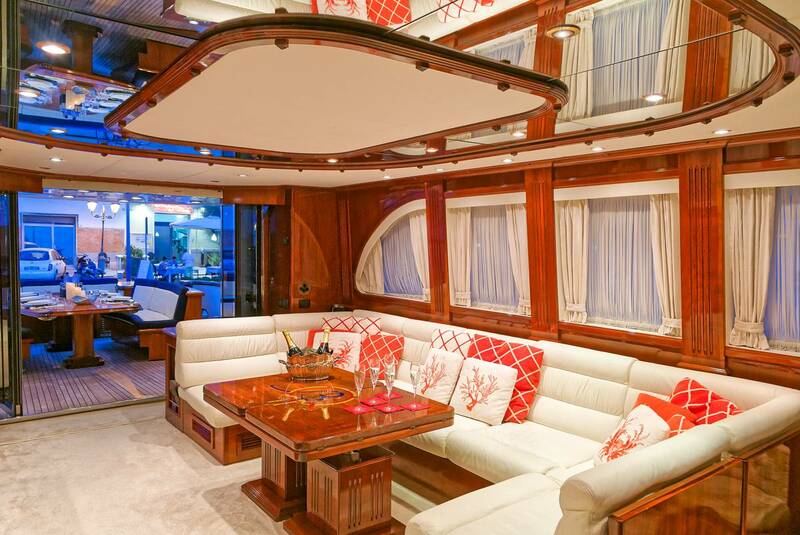 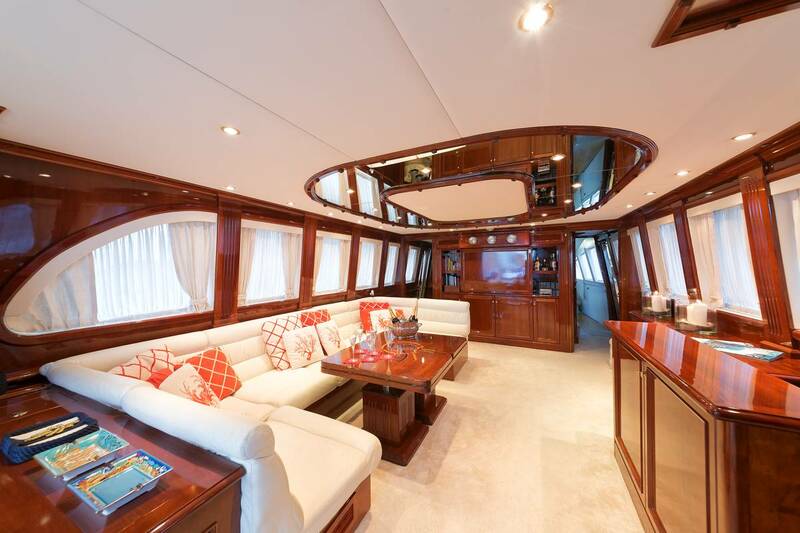 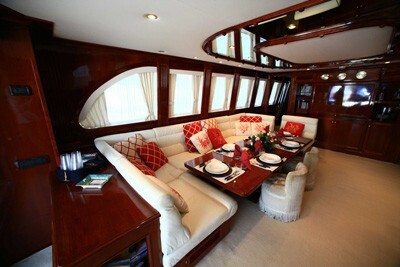 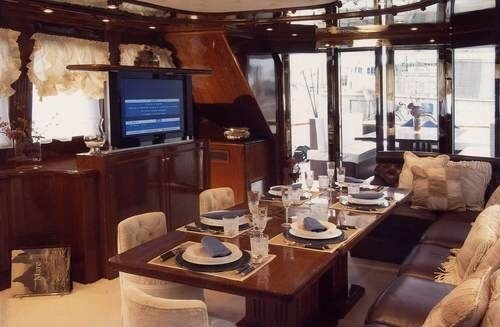 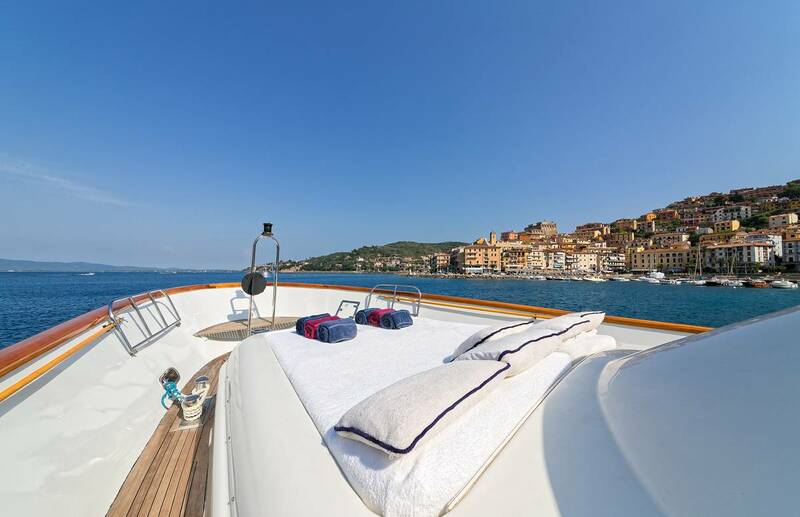 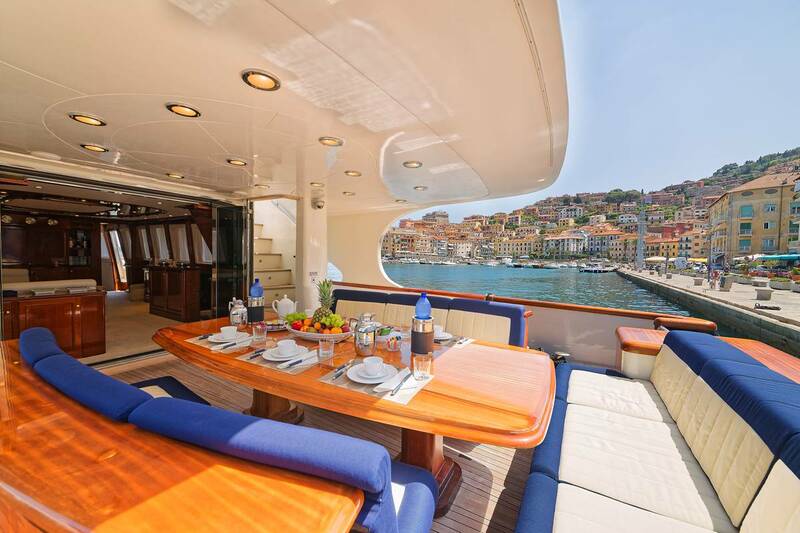 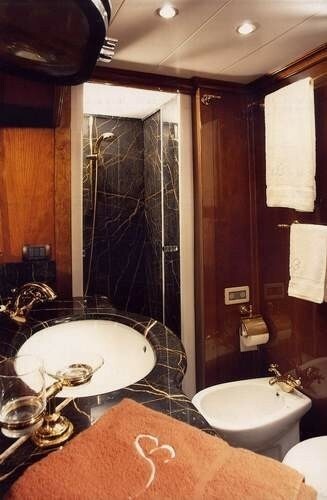 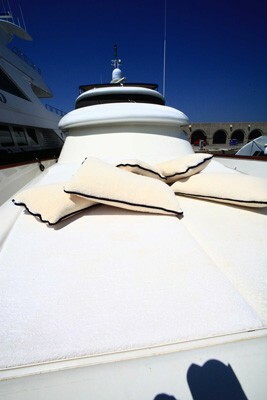 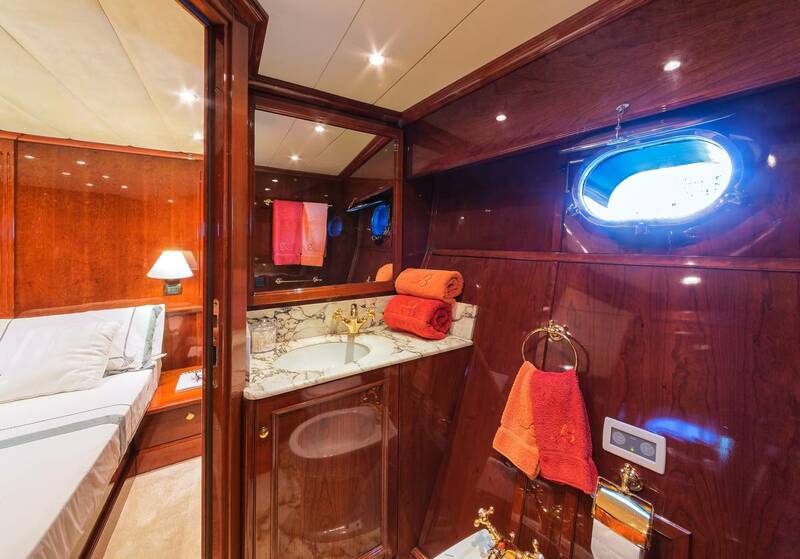 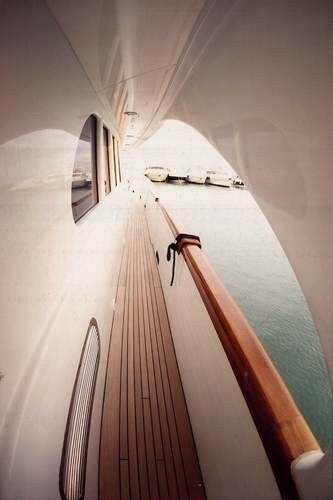 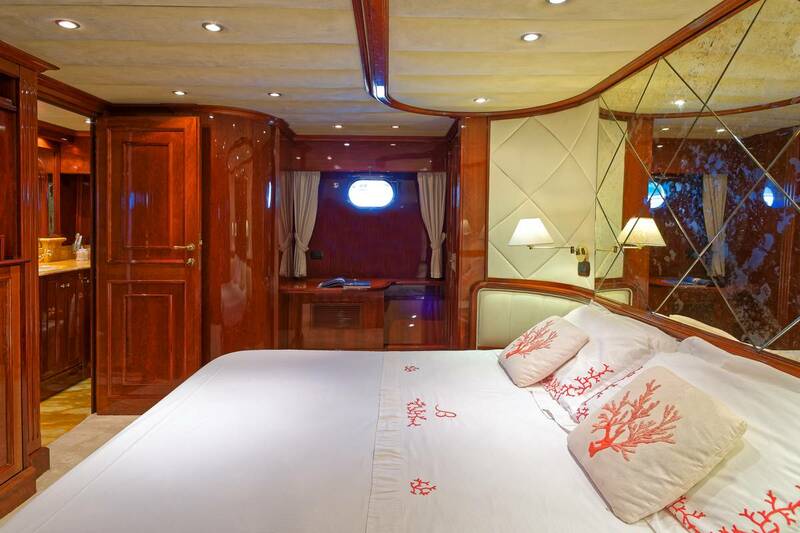 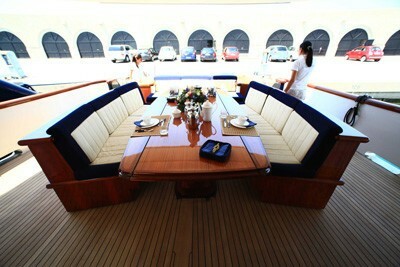 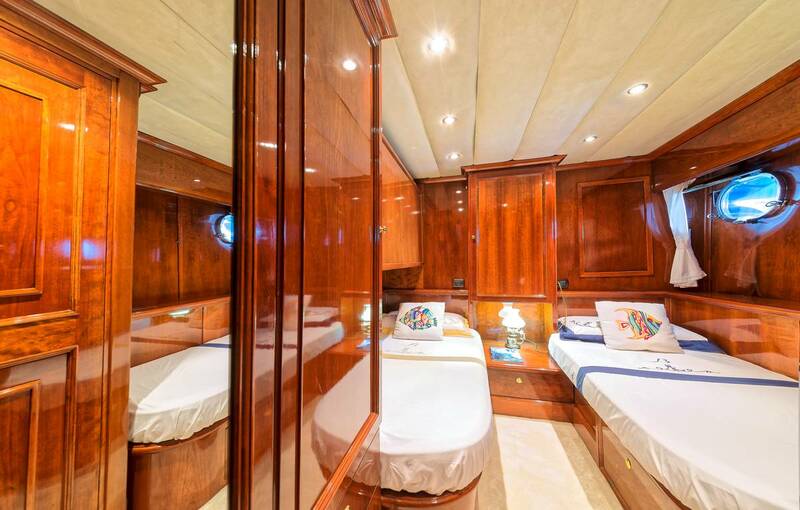 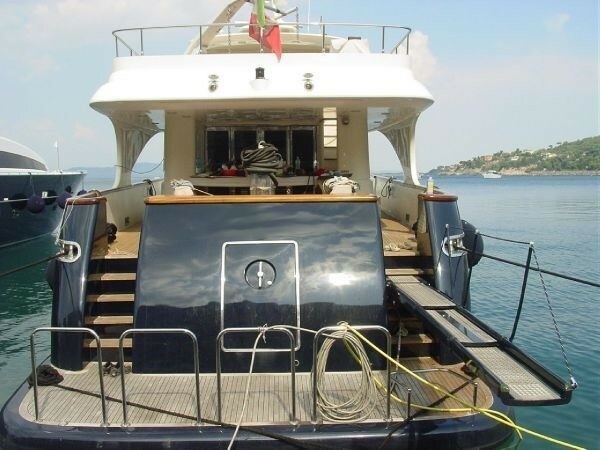 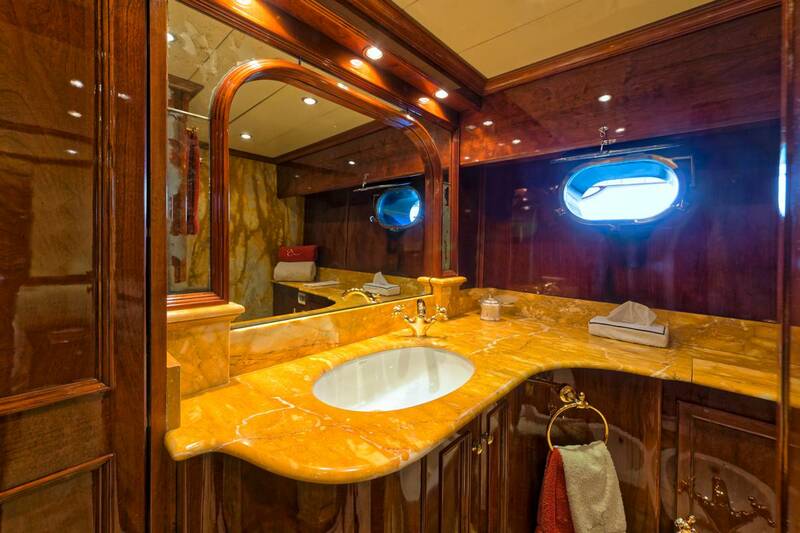 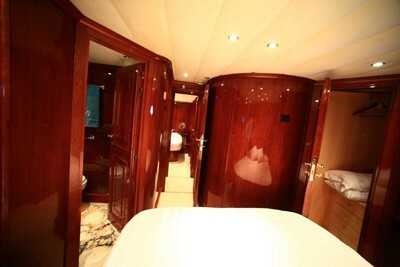 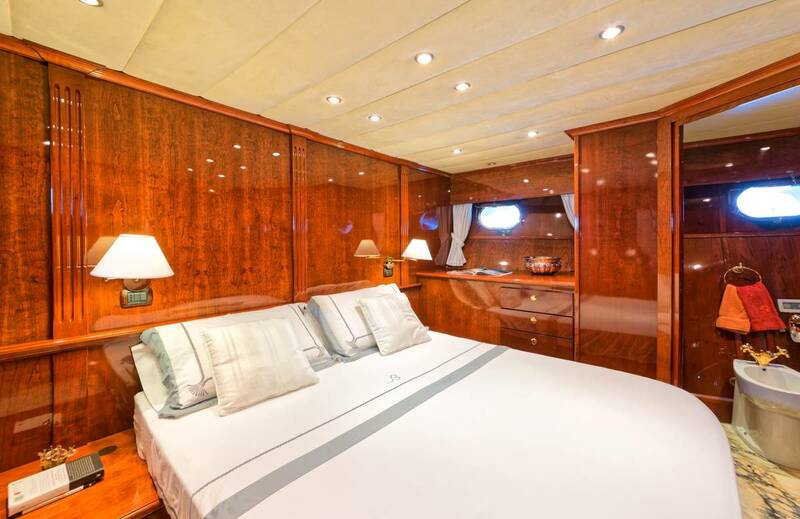 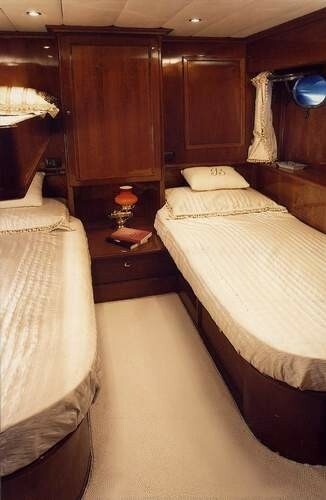 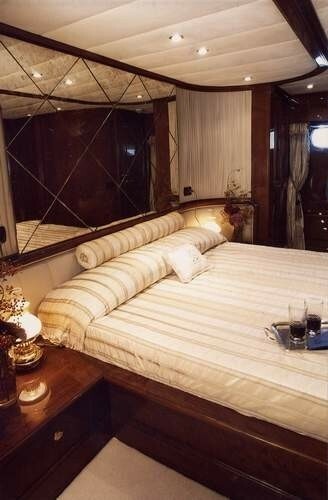 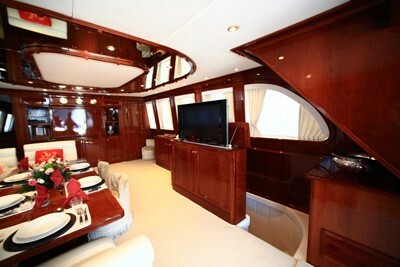 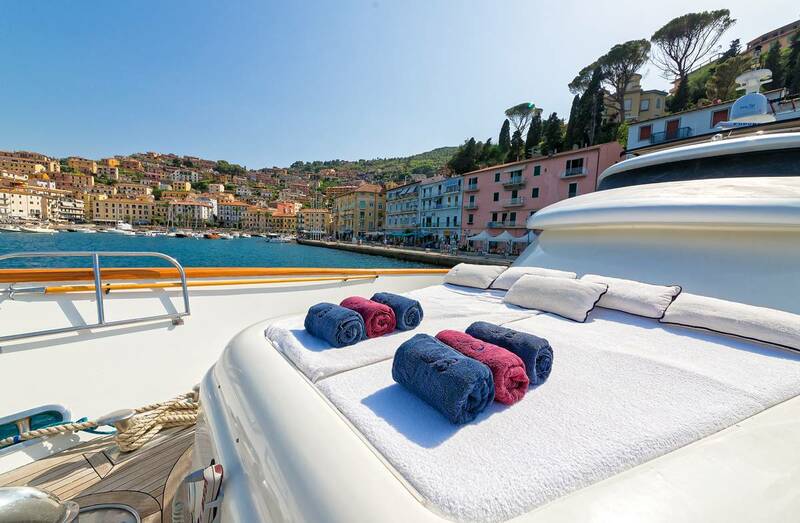 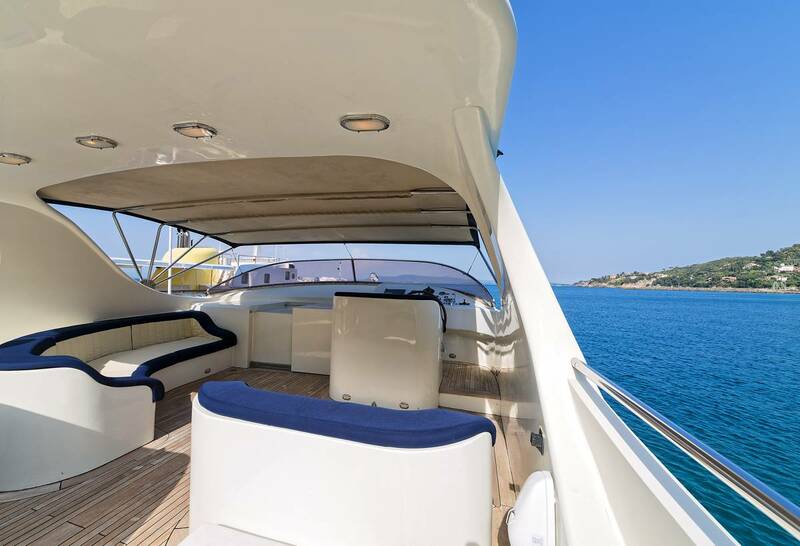 Luxury charter yacht BUGIA offers guests 4 spacious cabins all with en-suite marble facilities. 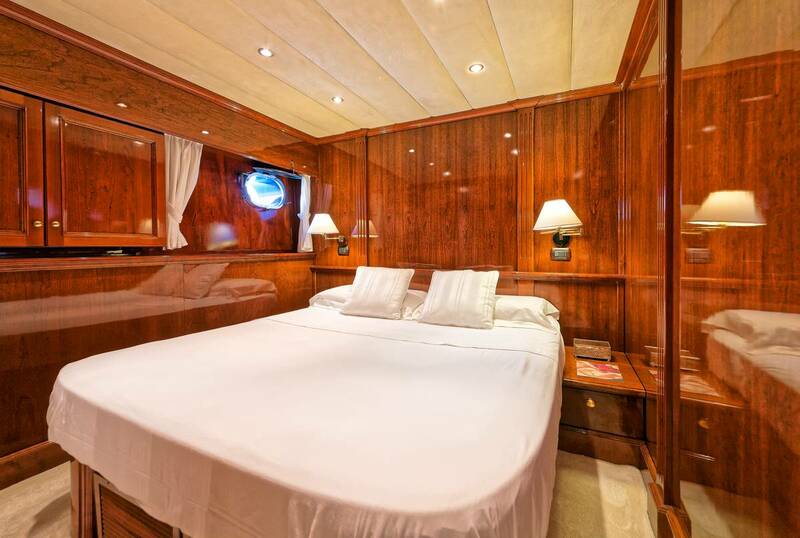 The master cabin is aft and features a double bed, a further 2 cabins offer double beds and a twin cabin offers 2 single beds and a Pullman berth, the cabins are tastefully decorated with a quality Italian flair and signature BUGIA furnishings.